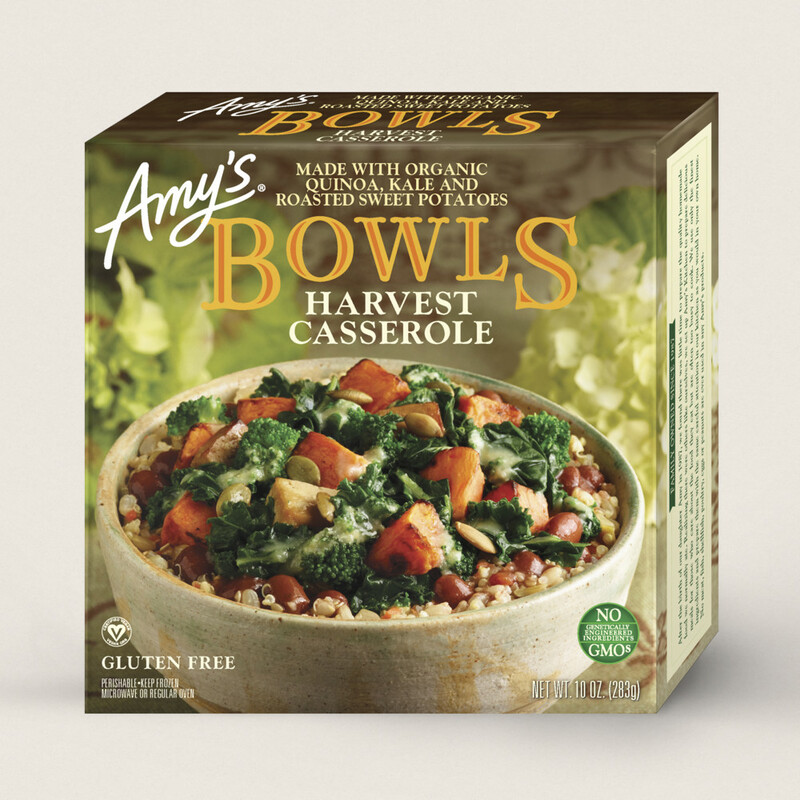 This post is not about vegan camping. I’m afraid I am not that outdoorsy as to pitch a tent and start a fire. 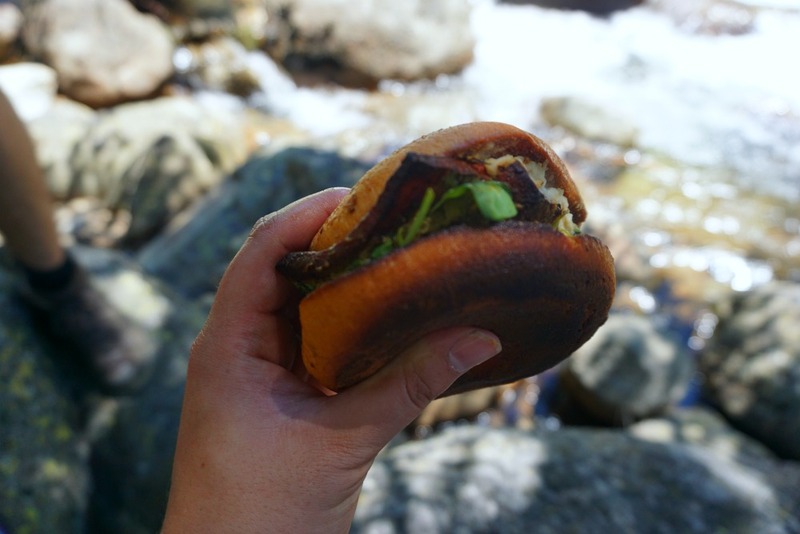 This post is about how to fuel yourself during the day long hikes in Yosemite, where to stay, and how to plan your food! 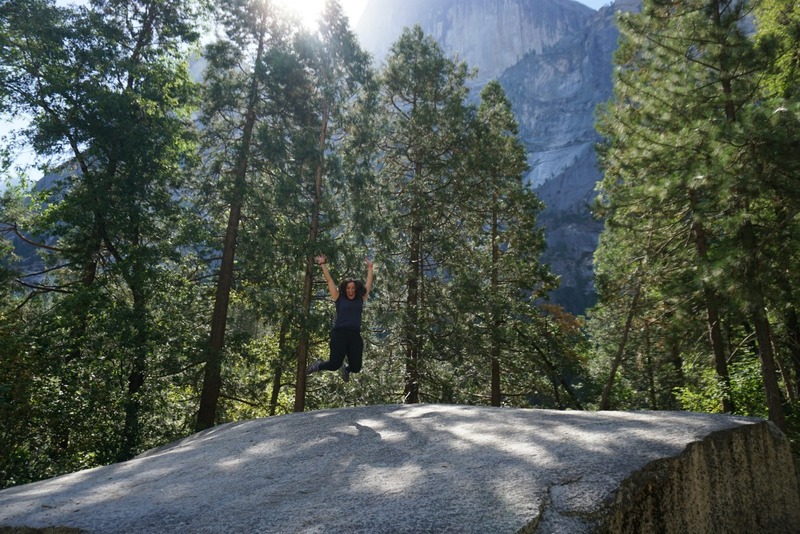 In an ideal scenario you book Yosemite early … like 8 months ahead early! Then you can book one of the resorts inside the park! Such a scenario is not feasible with my chill latin family. We booked 2 weeks in advance 🙈. I can’t believe how little the late booking ended up impacting the trip! We were able to get a room in Yosemite View Lodge. The hotel closest to the park one can book without being IN the park. They even have two pools and all the rooms have a little kitchenette. It was great and we couldn’t have wished for a better outcome. Many people suggest staying in Mariposa but that is a good 2 hour drive away!! Even Yosemite View Lodge was 40 minutes from the park. There’s only so much driving one can do. You’re going to need a car. Yes there are routes by train but they will take all day. Yosemite is definitely a destination where a car is a must. 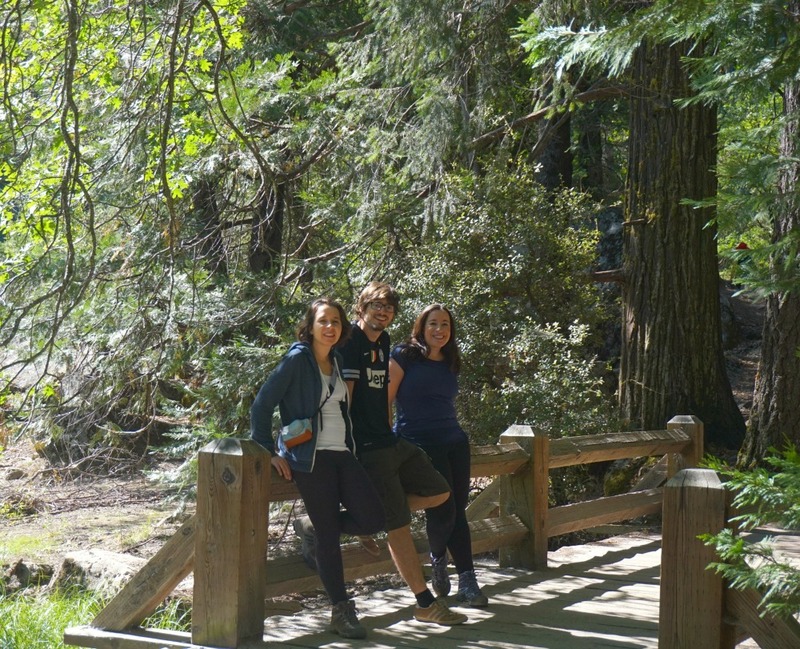 There is the Yosemite bus line – YARTS that will take you in from your hotel in the surrounding area. In the park there are shuttle buses to take you to hotels and hiking sites. We took YARTS the first day so we wouldn’t have to worry about parking and ended up regretting it. 1) Parking isn’t bad if you’re there really early. 2) The last bus back is way too early at the end of the day. You can’t have dinner in the park! 3) You save nothing. The entrance fee and parking for a car for 7 days is 30 dollars. 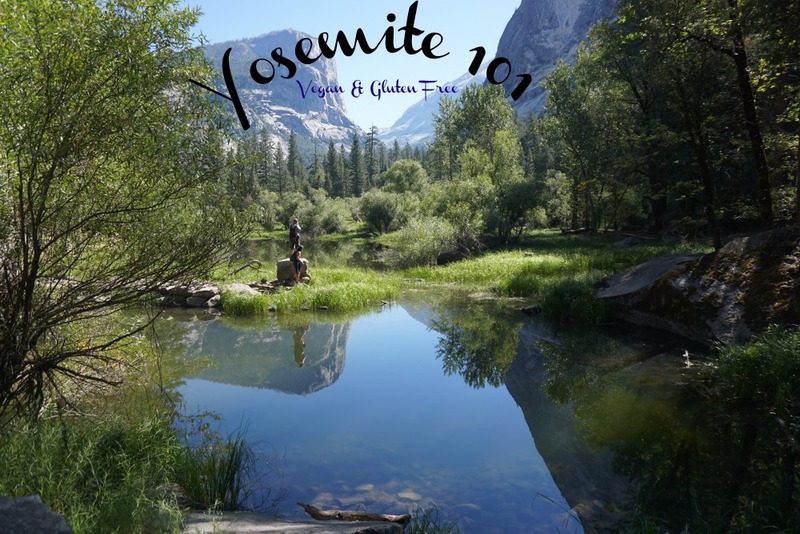 A return ticket from Yosemite View Lodge is $7/person/DAY. So we ended up paying double and had less freedom time wise. Another reason someone might not take a car in is bears. 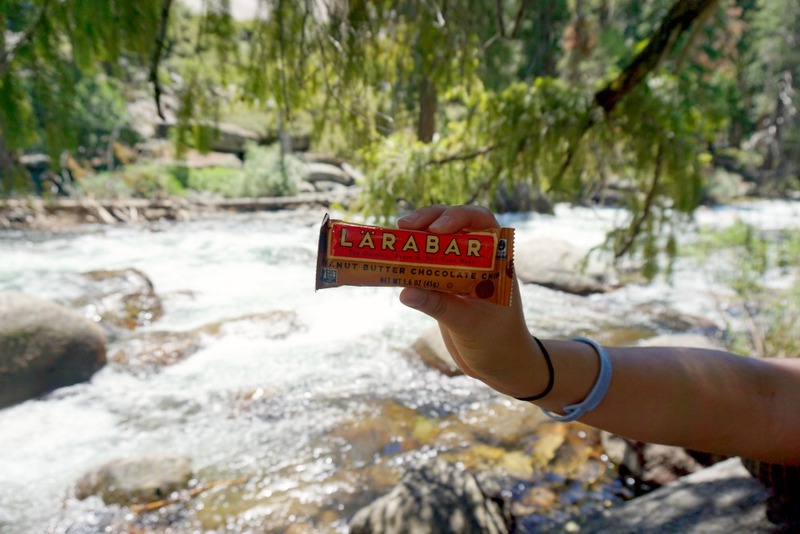 If you leave ANY food in the car (they WILL smell the Larabar under the seat and go for it!) you might find your car broken into and covered in scratch marks. A black bear can smell 7x better than a bloodhound! They don’t like picking berries all day. Human food has way more calories for way less effort. So the solution there is to leave absolutely no food in the car. Each parking lot has bear safe food lockers where you can lock your food up for the day. We did this on day 2 and it worked perfectly. We did actually see a bear once during our hike! 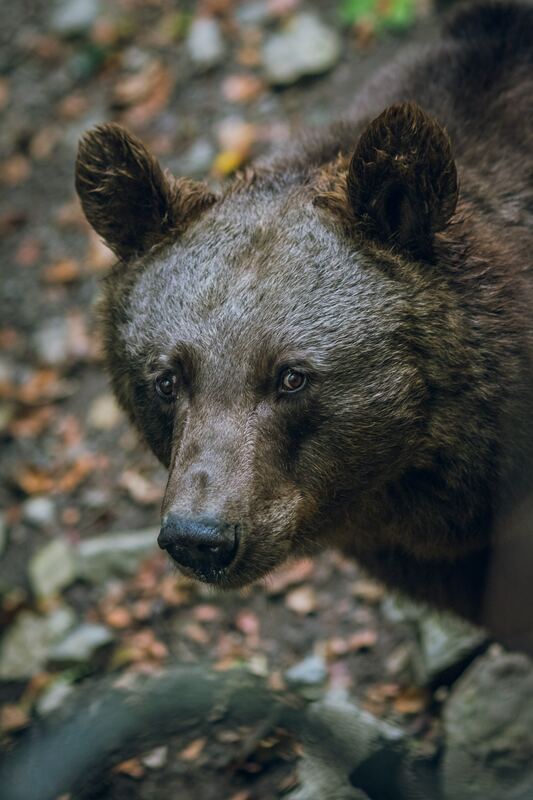 Yearlings (the year old bears that just left their moms) don’t know to fear humans yet. So they smell the food and come! A young bear was very close when a ranger with a tracker came running, started yelling at the bear to GET OUT OF HERE, and chased the bear up the mountain while shooting water pellets at it with what I think was a paintball gun. What a job! This will solely depend on your fitness level! The national parks service actually has a great youtube channel where they prepare you for different hikes with tips and water amount suggestions. They basically say, “don’t be that idiot who tries to hike half dome wearing sneakers and carrying only a litre of water. We spend so much money rescuing that idiot (they then charge you! )” You will need more water than you think! 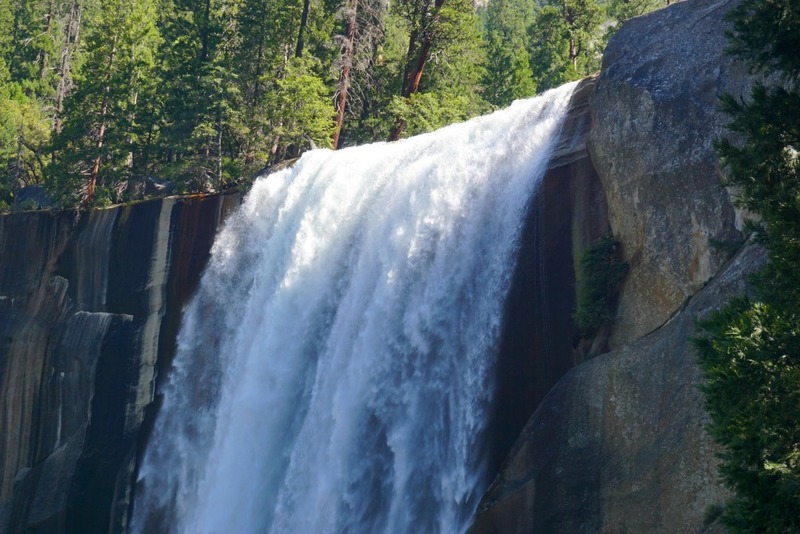 I ended up buying a 2 litre backpack water insert and I could have used another litre (we started hiking Vernal Falls and then decided to continue to Nevada falls- the park water recommendations are spot on!). We ended up hiking the whole mist trail and it was beautiful and a day well spent! It was also exhausting and not for the completely unfit. The last track is really steep! On our second day we were way tired and ended up just doing a leisurely hike around mirror lake which was lovely! That said, I wish I had done more research and known about glacier point before. Will definitely be adding that hike next time! 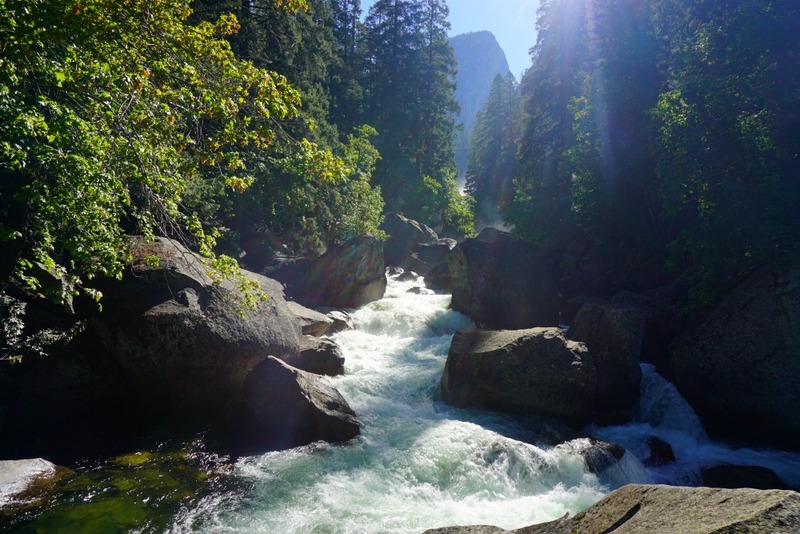 There are hikes for all levels in Yosemite. The number one tip would be to look them up ahead and know where you want to go. Reception is spotty in the parks and our hotel for instance had NO reception and the wifi (that we had to pay for! 😡) was super super crappy. So there was no looking up hikes on the go. The million dollar question!!! The restaurants IN the park all have vegan options that can be made gluten free or already are and they all sound fantastic. Like the roasted pumpkin filed with quinoa pilau served in the Big Trees Lodge. See all the restaurants and their menus here. Be sure to reserve! On night one: We microwaved frozen dinners we picked up at a Target on the way. It was quick and easy which was what we needed after a 3 hour drive became 6 with Friday afternoon traffic. Day two: We had yogurt and granola bars for breakfast as well as some toast. Lunch was sandwiches that we packed: the ultimate vegan hiking sandwich (recipe at the end of post) and an almond butter and strawberry jam sandwich. For snacks we had soy jerky (available in some of the yosemite shops), trail mix, and dried mango. For dinner my sister and her boyfriend got pizza at the pizzeria in our hotel. There wasn’t anything I could eat. The second restaurant had a stir fry dish for $20 that could have maybe worked but I wasn’t in the mood for it and made myself a second sandwich. My favorite larabar for dessert. Side note: Mariposa has some great shops with cute clothes- even fair-trade! Definitely worth checking out! While Yosemite is suuupppeeerr instagrammable- cute outfits will be regretted part way through the day. It is HOT there in the summer. Temps reached 39 degrees most days. The hikes are physically straining. So please consider putting together a cute workout outfit and hiking in that! 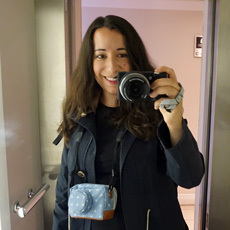 I used a light backpack (it has a whistle, reflecting stripes, and plenty of pockets) , a light jacket for the evenings or rain, a hydration pack (water bottles on the side pockets of the backpack will work well too!! ), and these vegan hiking boots. I have tested the boots a few times now and they have not failed me! No blisters and they are very waterproof! Keep an eye out for when Amazon puts them on sale. Don’t forget sunscreen and a natural bug spray! I got one of the yosemite caps with a bear on it and did not regret the purchase. Happy in my hiking boots! This is day 2 which is why Andi isn’t wearing his hiking boots- mirror lake doesn’t really require them! We recently bought a cooler for longer trips like this but with the Yosemite View Lodge having a kitchenette with fridge, we were fine without it. I just put the yogurts and sandwich fixings in a trader joes insulated bag with frozen water bottles and it was fine. Peppers – roasted or raw, both work! I personally really like the combo of arugula and mustard but that is personal preference I’m sure! The hummus and baked tofu make for a really filling combination. Use whatever gluten free & vegan bread you can find! It’s not always easy. I have had luck at sprouts stores. 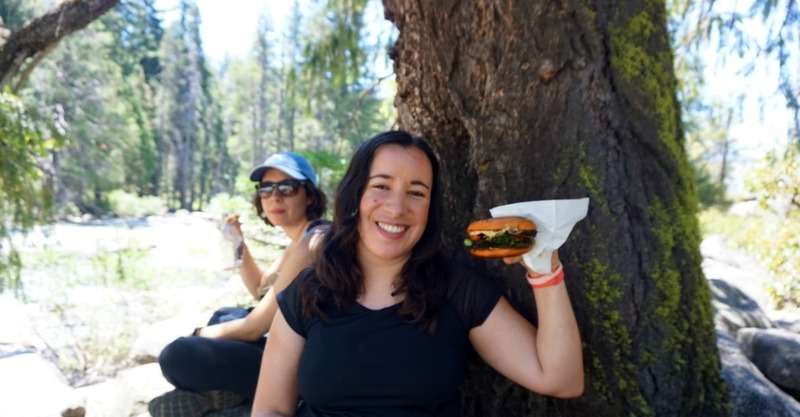 As yummy as this sandwich was, the best part was definitely eating it among friends and a view! To summarise: take the car, stay as near as possible, pack a yummy sandwich and lots of water, and have fun! !